I just wanted to check in real quick with you all and let you know I am doing ok! With every day closer to my surgery date, I do face new challenges and pain, but I am so blessed with all the love and support from my friends and family. I will be having some of my dear friends guest blog for me, starting next week. I hope you can all show them some love on their blogs. These are all very talented Women that have taken their time and effort to write up gluten-free posts for you all. I hope you enjoy these ladies as much as I do. In the meantime, I will find you some recipes from around the globe to share with you. First up, this beautiful summer dish. 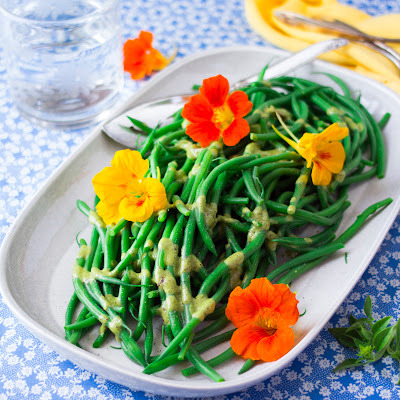 Green Beans with Basil Vinaigrette posted by Healthy Seasonal Recipes. Click the link below for the recipe!